For anyone in politics, each snapshot is also a means to measure how high, or low, Damocles’ sword is dangling. Because for every administration, public opinion as measured by the polls, is like a referendum. More than a taking of the pulse, a survey is an reaffirmation, or a possible rejection, of the mandate that administration got at the start. But, of course, there are two ways of looking at the same snapshot. You can look at the different responses, and report them individually: broadly speaking, approve, disapprove, and don’t know. Each response is reported separately and you have Gross Numbers. So the chart above, for example, only tells you the gross numbers for satisfaction. But there’s another way and it uses taking approval and subtracting disapproval, and the result is a net number. At a certain point, if the disapproval gets big enough, you start having negative numbers, as you can see in the chart below. It’s simpler and also more exciting for reporters. Note that the lines more or less maintain the same ups and downs. 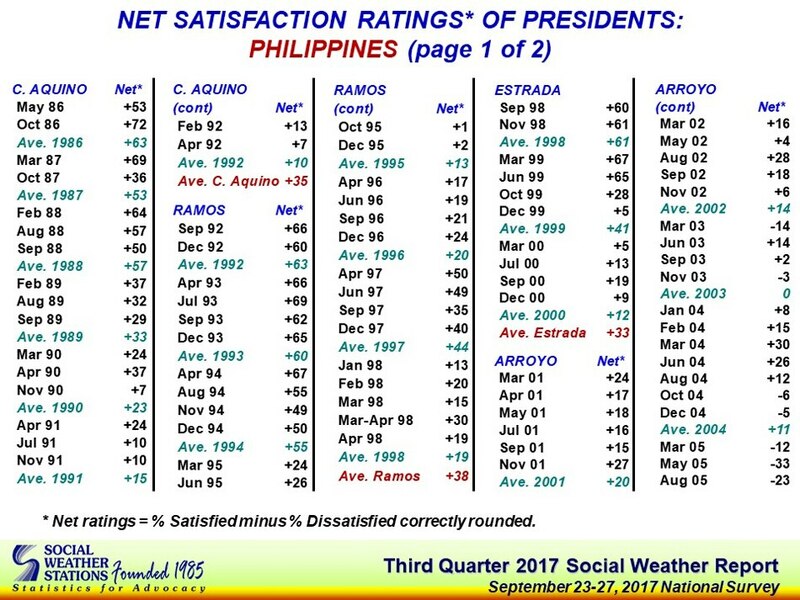 For now, let’s use Net numbers simply because the media taking its cue from the Social Weather Stations (SWS), which likes to use these figures because they’re easier to report and, I might add, they can be more dramatic Two of the most significant things looked at by SWS are satisfaction and trust. How satisfied are you, with the President in terms of his doing his job? How much do you trust the President? 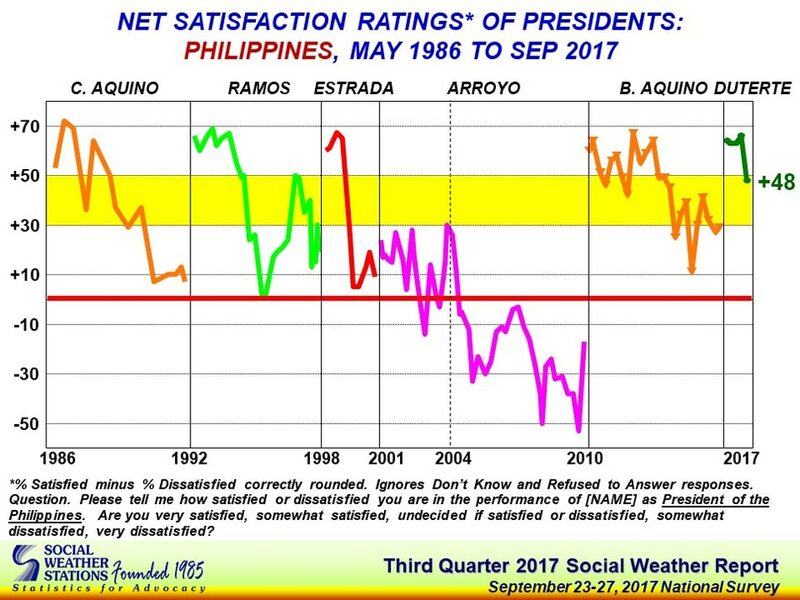 As you can see from this chart on satisfaction, there’s a rule of thumb: there is no way for any president to go, but down, in public opinion as time passes. Some presidents will recover, lose, recover again, and so on. Others nosedive and hardly recover. As more points get added –more snapshots are taken—all sides look to see if a pattern can be seen. The other way these snapshots are useful, is to see if there is a picture of health or not, in comparison to previous presidents at the same time in their terms. Presidents Cory Aquino and Gloria Macapagal-Arroyo rose to power not on the regular, June schedule, but earlier; so their timelines are different. 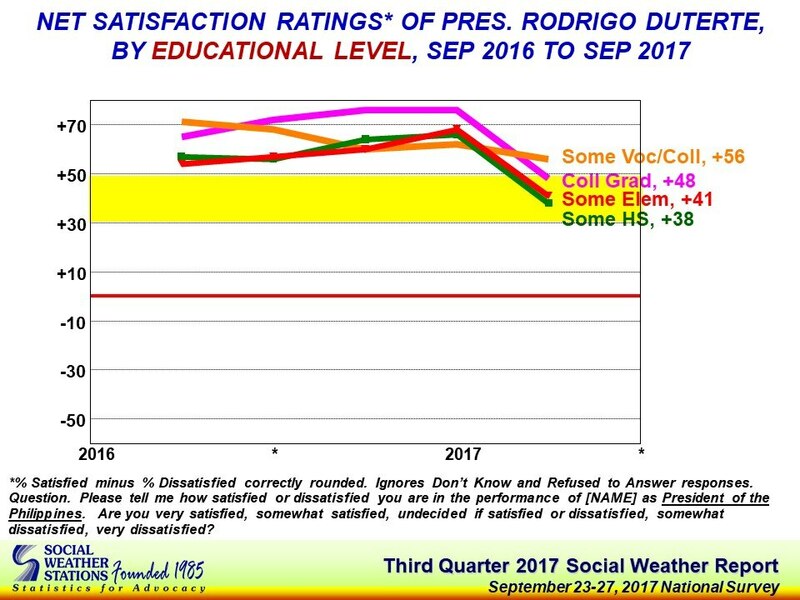 President Estrada didn’t have a September survey one and a half years into his term. So the best we can do is to compare the President, now, with two of his predecessors at the same point in time in their terms. At plus 48, he is not doing as well as Fidel V. Ramos (FVR( who had plus 62 and Benigno Simeon Aquino III (BSA) who had plus 56 this time in their terms. Now before we go on to further zeroing in on his performance results, let’s refresh our memory about two things. The first is geography. That is, where a President can count on people because they delivered votes to help him win. 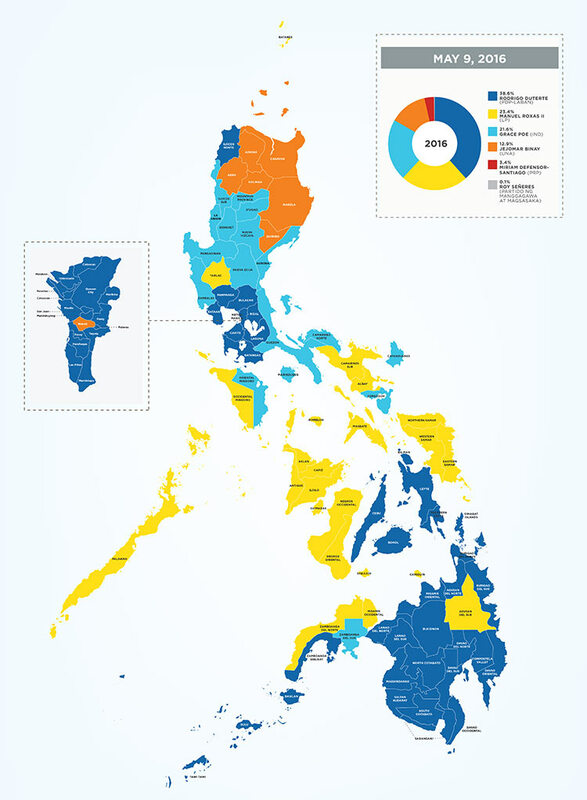 Two places count the most for the President: Metro Manila, and Mindanao. Which is not to say he didn’t do well in other places. But these are the places he did best. The other thing is, well, the people. What kind of people delivered for the President to help him win? Looking at the exit polls in May 2016, Mahar Mangahas observed the wealthier, the more educated, and the younger you were, the more likely you were to be a supporter of the President, and more males and non-Catholics went for him in comparison to his rivals. 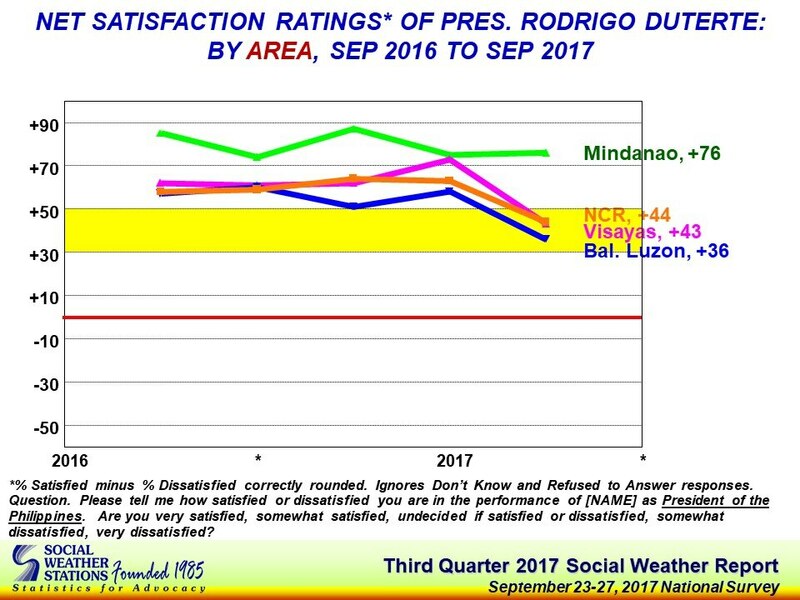 Bearing all of this mind, looking at the surveys since he took office combined, the President can take comfort in Mindanao being steady in its support. He has a problem with the Visayas, which has dropped the most steeply, although National Capital Region (NCR) and Balance Luzon have dropped too. As far as the President is concerned, urban and rural opinion are practically the same, though he had done better among urban people in the past. But in terms of his core support, they remain with him, firmly indeed. That’s the green line indicating you, the likely ANC viewer, who belongs to class ABC. In contrast to you is the sharp decline among the poorest of the poor, Class E. And a significant decline in the biggest portion of our population, Class D, as well. 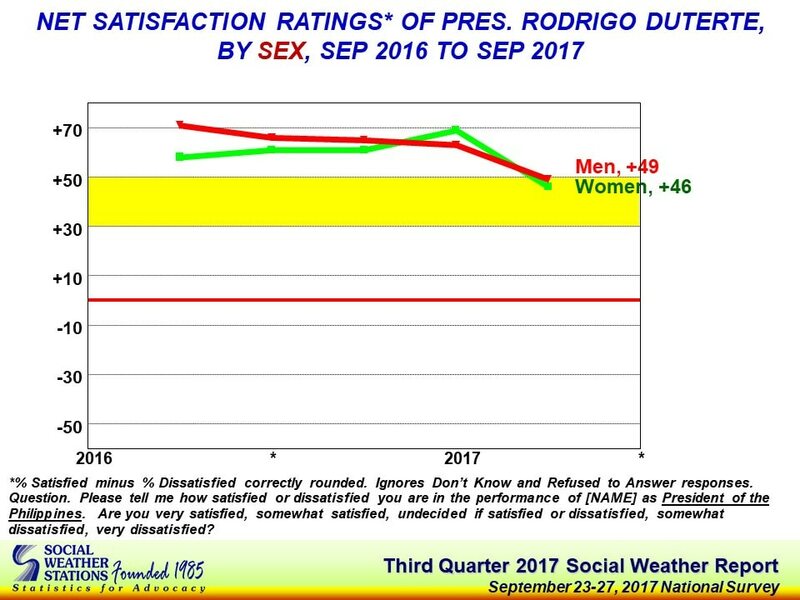 As far as men and women are concerned, the President has faced a steady decline among men, who used to prefer him more. In the recent past, he had enjoyed an increase in female support but he’s lost it, with slightly fewer women approving than do men. In another core demographic of the President, College Graduates among whom he did well in 2016, he has done the worst. That’s the pink line, which started dropping sharply this year. All other levels have dropped as well except for those with Some College or Vocational education, who are holding the steadiest. How does it all come together? For this we have to thank JC Punongbayan, who is a doctoral candidate at the School of Economics of UP. Looking at the President’s performance ratings year on year, that is, from two snapshots, September 2016 and September 2017, he’s zeroed in on where the President has gone. It’s generally negative, across the nation, regions, economic classes, ages, sexes, and educational levels –with the exception of Class ABC–you, the viewer—which is the only place where he is marginally better today than he was in September last year. 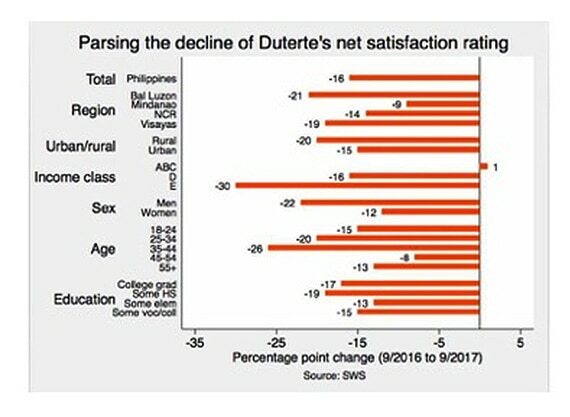 The President has lost the most satisfaction in Balance Luzon and the Visayas, among rural Filipinos, among Men, and among those ages 35-44 who are young parents, perhaps, followed by millennials 25 to 34 and seniors 55 and above. Now this brings us to the second question: trust. The President, before he won, had only slightly over half of the public trusting him. When he won, trust went through the roof. It stayed there, in the low eighties, until June this year. Much has been said and written about how victory crowns our officials with public trust. In a sense, the winner takes all. All the power, and all the trust of nearly all the people. But since June, the latest snapshot tells us something different. Trust has dropped nine percentage points since then. Last September, that is, a year ago, I looked at the President’s trust numbers and made some observations. It was very early on his term, and the changes were tiny. So tiny, they were statistically not worth mentioning. So, in looking at the numbers then, I put forward a thesis. 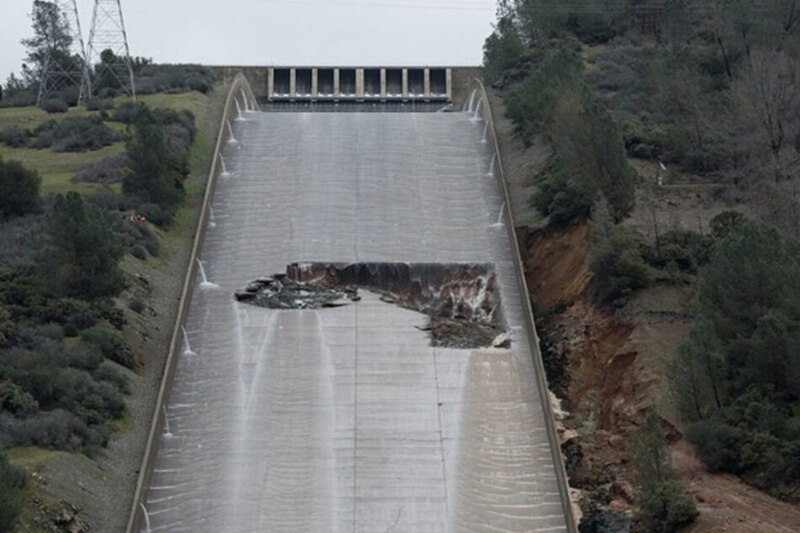 Either these tiny changes were little hairline fractures that could develop into wider cracks, or they were things that would go away and not matter in a few months or a year. 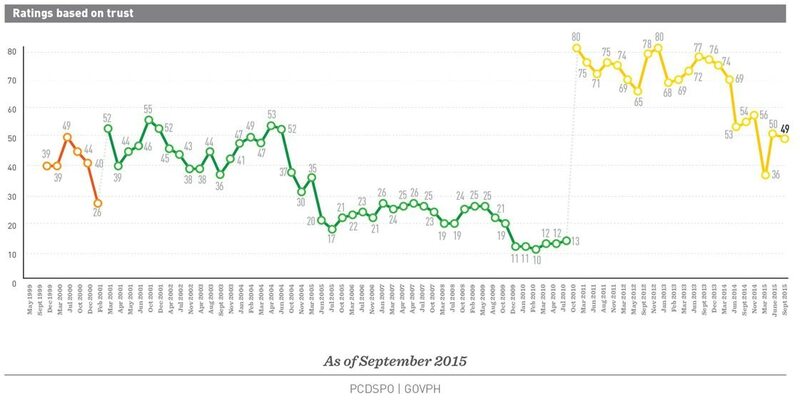 Just as JC Punongbayan did with the President’s satisfaction ratings, I went back to look at the snapshots from September last year, to see where public trust has gone, in the full year since. I’m grateful to SWS for providing a copy of their detailed findings on trust. 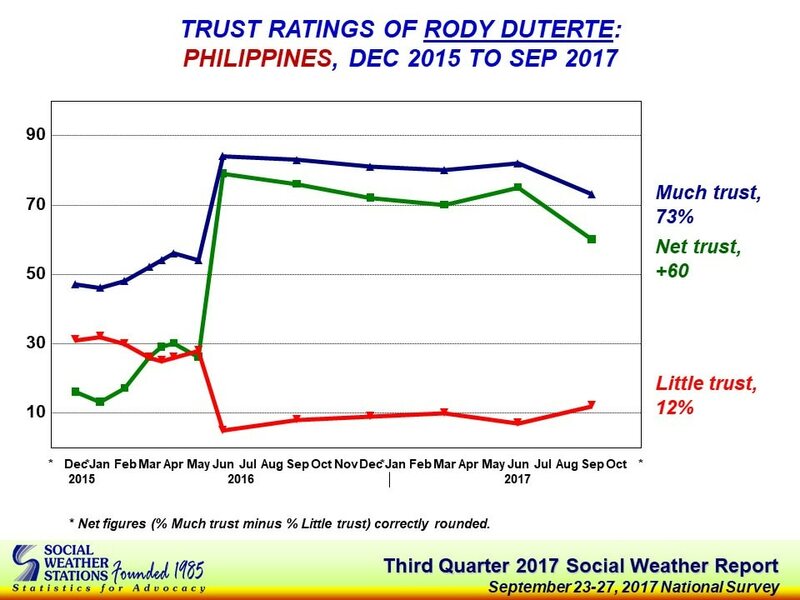 Last year, I noticed that it was in the Visayas that Little Trust in the President grew. 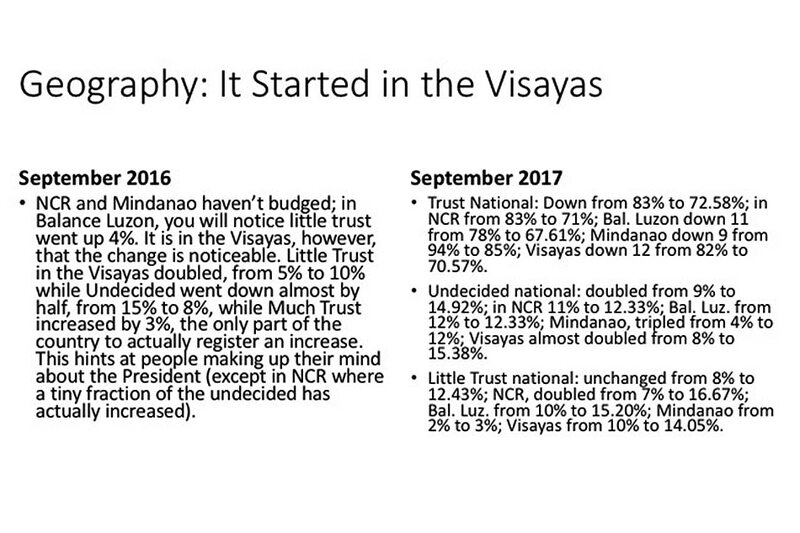 As it turned out, year on year, the erosion was slow but sure; and added to this was a drop in trust in NCR which doubled in a year, and in Balance Luzon, though not quite the 6% change that would really matter. Also significant is that the number of people undecided about whether they trust the President has doubled in a year, too. 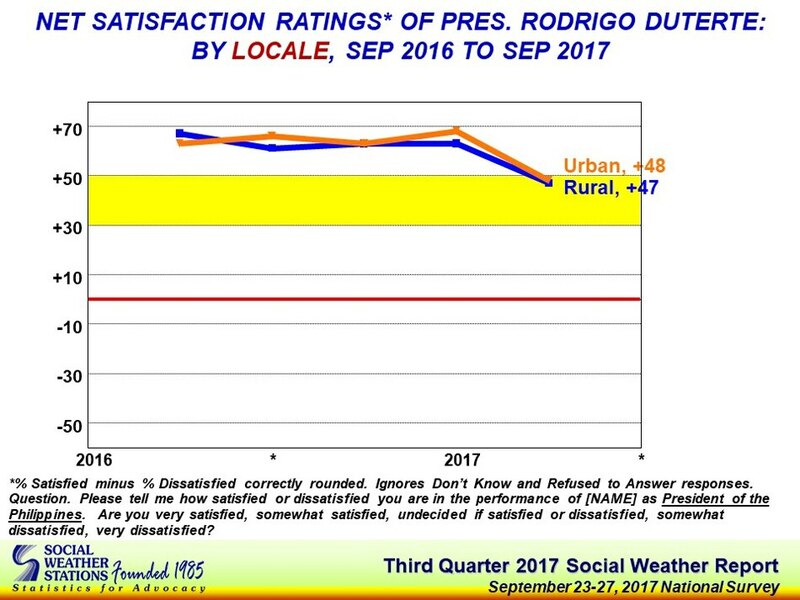 In terms of urban and rural citizens, last year the President had improved his trust ratings among rural people whose indecision went down and who decided to trust him. 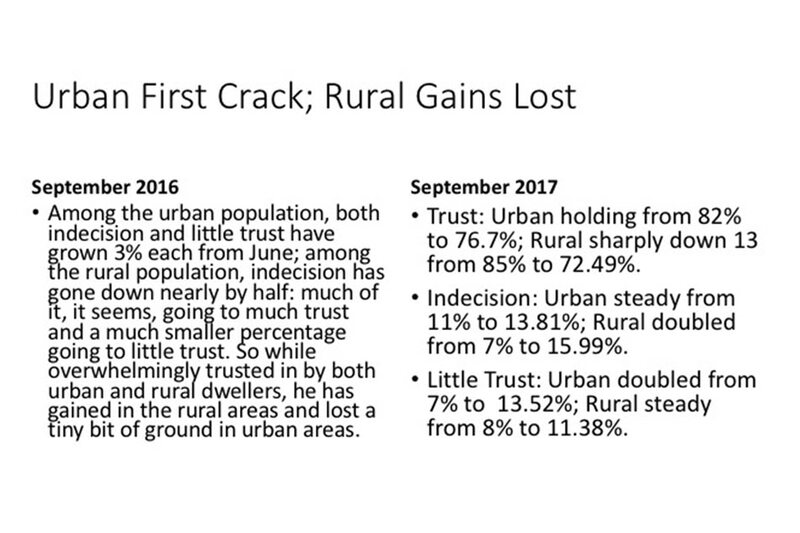 But in the year since, the President is down 13 in terms of rural trust although urban trust seems to be holding. Indecision, too, has doubled among rural people while little trust doubled among urban people. 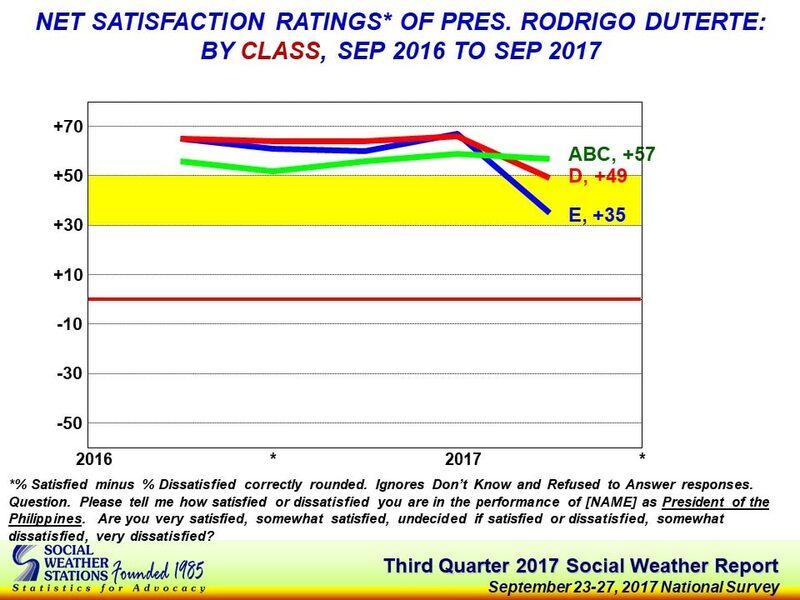 For the ABC classes, satisfaction in performance is matched by trust in the President. But indecision has doubled, taking away some who’d formerly lost trust. 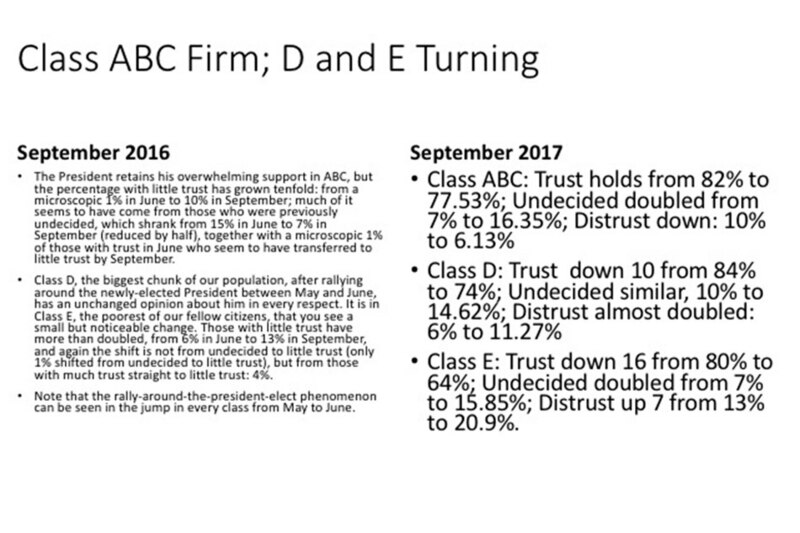 In Class D, however, distrust has nearly doubled and trust is down, overall; for Class E. trust has gone down by no less than 16, with indecision and distrust both doubling. As for men and women, tiny cracks had begun to reveal themselves in September last year among men. 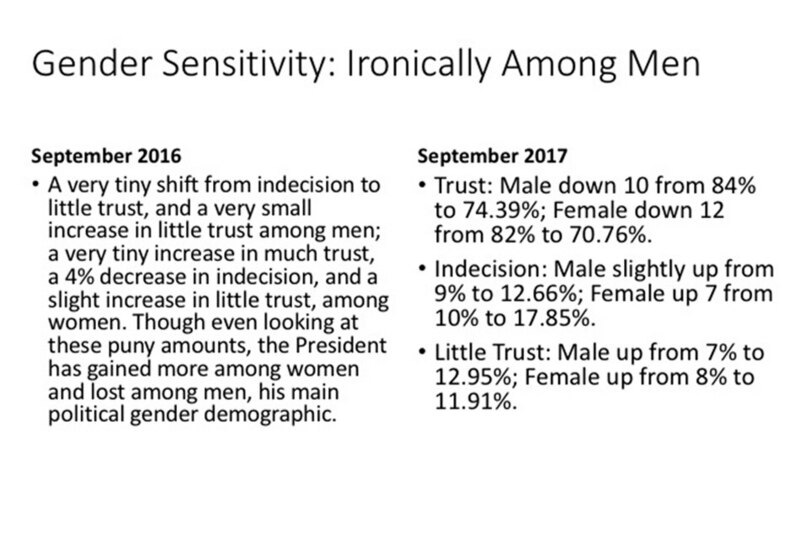 As it stands today, in a year the President has gone down 10 and 12 points each among men and women, with more women shifting to indecision, and little trust hitting low double-digits. As far as educational attainment is concerned, last September, the President was solidly popular among those with a College degree; he’d gained a tiny amount among those with some College education; but little trust back then tripled among those with only some elementary education. 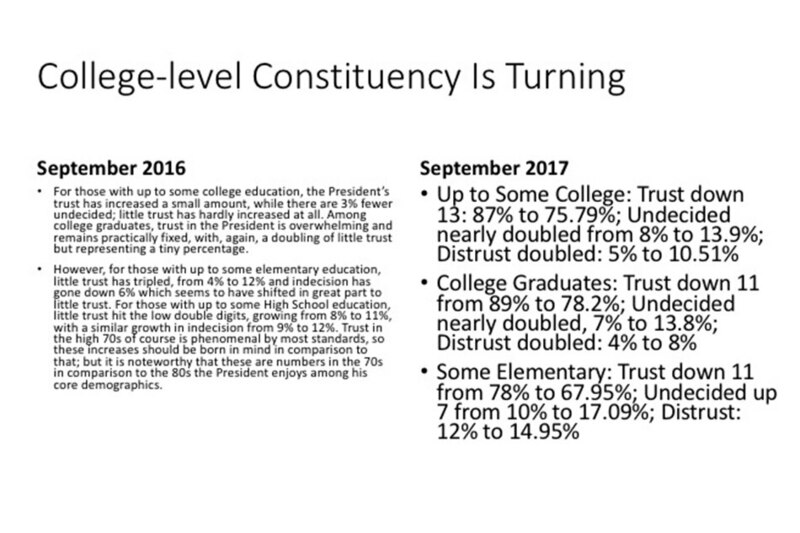 In the year since, the President has lost most from those with some College education, down 13 points in trust, with indecision nearly doubling and distrust doubling; he’s down 11 points among College-educated people, indecision has doubled, and distrust has doubled. A similar drop among those with some elementary education. So, what do these latest numbers tell us? Let’s not forget the big picture. 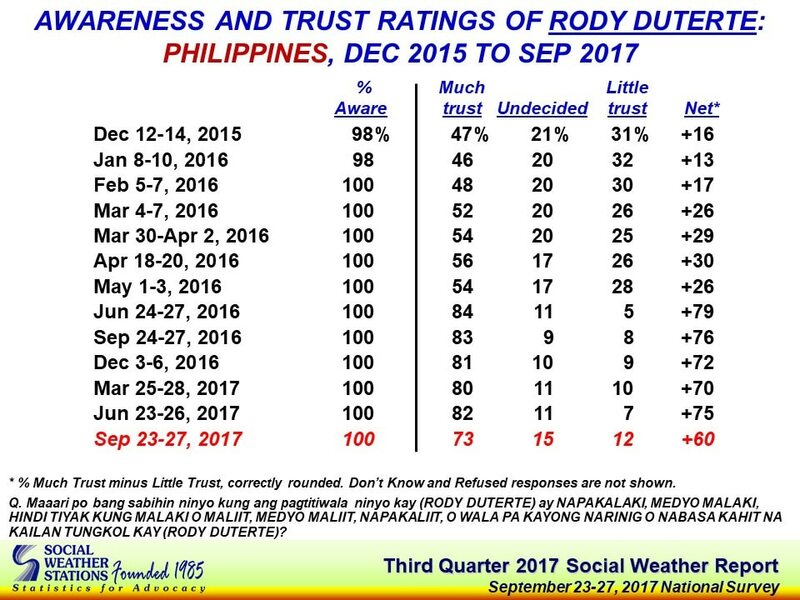 By most measures, seven out of ten to six out of ten Filipinos are satisfied with the President’s performance and trust him, if you look at the gross numbers. 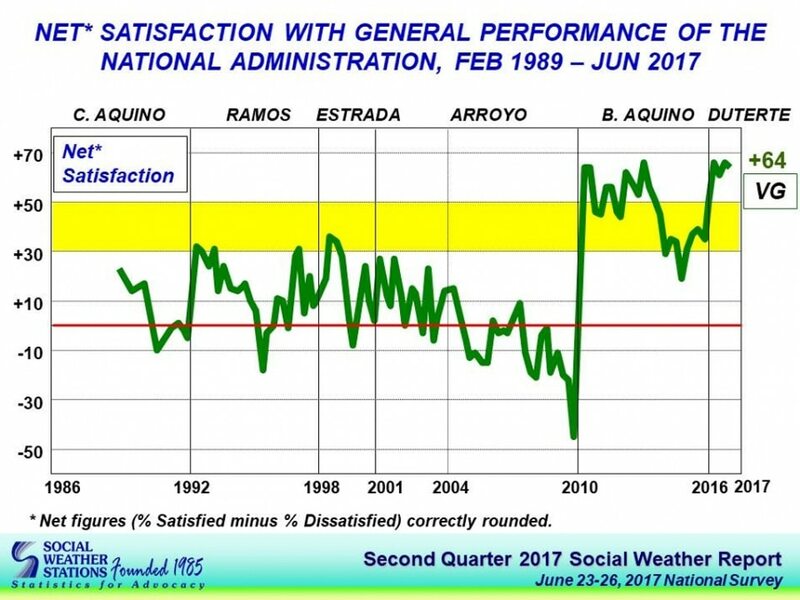 The net numbers tell a slightly different story: at +48, the President’s job satisfaction is no longer a majority opinion. Trust in him, net-wise, though, is better, with +60. But in both cases, this is a far cry from where he was just last June, and where he’d been, steadily, from the June before that. So, in a year and a half, the President has gone from exceptional, to normal or even slightly less than normal, compared to the only measure that matters for someone like him, his predecessors. This comes at a time when the President is gearing up for a lot of big battles, involving politicians who can read the numbers as well as he does. His popularity, still very high, reveals that he is now a victim of his past success: more normal numbers means he is not, at this point, a political superman anymore.